Next Gen Borough Hubs exist to help connect children’s and youth workers within specific boroughs. They gather on different days and different times throughout the year. Click on the name of your borough below to find out what’s happening where you are. Please email Deb@loveblackcountry.org.uk for more information on any of the Next Gen Borough Hubs. Dudley Kids have a Hub that have been meeting for the last 6 years. It is a mixture of paid workers and volunteers and the group meets to encourage and support each other every few months. Traditionally they have met in Costa at Merry Hill but they also meet in their local churches which gives a greater space for deeper discussions and prayer. Over the years many in the group have supported each other with holiday clubs, resources and special events. Attendance varies each time they meet but anyone is welcome to join them! One Heart Sound is the Dudley Youth Network. This group has been meeting for a number of years and it began with a youth event focused on social outreach and worship. The group worked together during the Higher Tour in 2018 and have since continued to meet and plan how they can help each other reach this next generation. The current plan is to focus on ploughing and sowing during 2019 through prayer, conferences and learning communities. The proposal is then for some reaping events in 2020 followed by a keeping strategy in the years that follow. The group also meet socially to build relationship and connect with others with a similar heart in the One Heart Sound Hub. 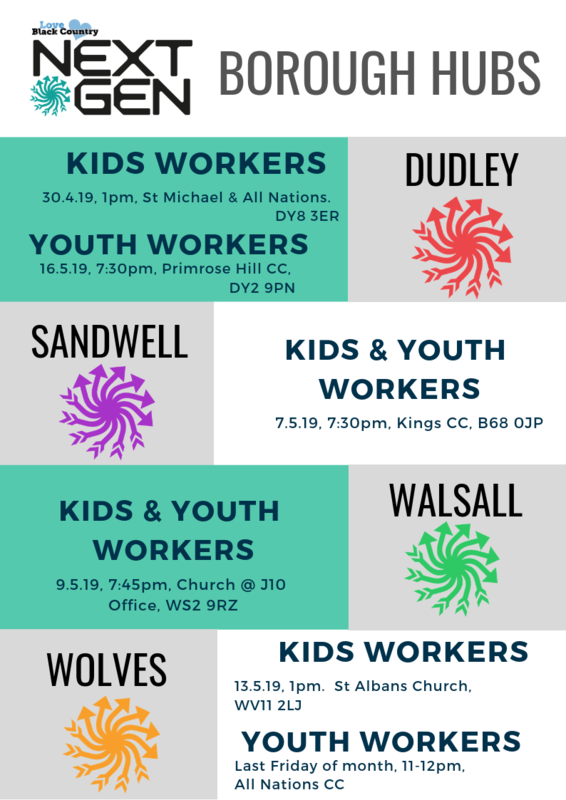 Sandwell Kids and Youth Hub is a newly formed group of anyone who leads next generation work in their church. The first hub meeting was very informal and focused on people getting to know each other! There are a few paid workers in Sandwell and many volunteers too and all are welcome to join the group. It may be that the group separates the kids and youth workers at some point in the future but for now the group is making new connections between the churches represented and has begun to dream about what the future might hold if everyone works together to reach the young people in Sandwell! Walsall kids and youth workers have begun to meet every few months to build relationships between the churches. This Hub Group is an opportunity for people to get to know others who have a similar role to them in the local area. It is a great chance to share ideas and resources (we even found out someone has a camel prop if anyone is interested in borrowing it…!). It also provides a space to share challenges and ask for help! The group is new and currently meets in a coffee shop or a local church so anyone would be very welcome to join them with a heart for the next generation in Walsall! Walsall also have a monthly gathering of youth from several churches across the borough called Big Youth! This takes on a variety of themes and activities each month and includes a weekend away. It is a great opportunity for the teenagers from different churches to get to know each other and is also an environment that encourages them to encounter Jesus. Wolverhampton have a new Hub Group for anyone involved in kids ministry. It is a great chance to meet others with similar roles and responsibilities and usually involves coffee and cake! This group is a safe space to share any questions or ideas and is a fantastic opportunity to find out what others are doing in the local area and share resources. The group meet every few months and would love others to join them! Wolverhampton also have a youth focused group called Relentless. This group of youth workers meets on the last Friday of every month and their focus is to build relationships and to pray for the next generation. They also have a prayer focus on the last Thursday of the month. Their focus currently is on the story of Nehemiah and they are started to discuss how they reach this next generation together. They are planning some joint events in the summer and have a vision to impact their community through schools work too. Anyone would be welcome to join them for any of these events.